Many of us have heard of the incredible benefits of RevitaLash for thin eyelashes and eyebrows. The same science behind the amazing lash products now brings us ReGenesis for fine and thinning hair! ReGenesis was created around the RevitaLash Advanced Conditioner (now ReGenesis Fast-Absorbing Foam). While some brands may offer products for a variety of concerns, ReGenesis focuses on fine and thinning hair for men AND women. With a combination of plant extracts and scientific cosmetic ingredients, products enhance the natural volume of hair while improving the health of your hair and scalp. Apply the convenient rollerball Spot Serum 2-3 times daily on trouble zones like the hairline, part and crown. 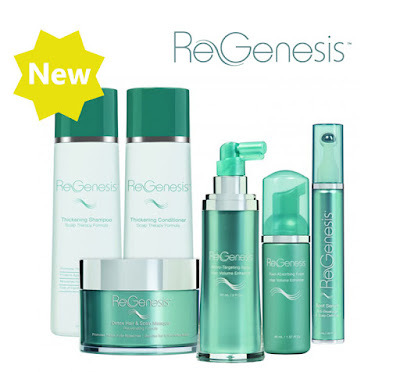 Do you have questions about ReGenesis or thinning hair? Our beauty experts are here to help!